We all want to build student literacy skills and close the achievement gap, but how? Over the next seven days, I will present one action you can take to make a difference. You can help build student literacy skills right now no matter where you are, who you are with, and how much time you have. Start by seeing the literacy learning opportunities around you. In there any print in the environment? If so, have your child read it to you or read it to your child. Discuss what it means. Who wrote it? Why is it there? Talk about the purpose the text serves and how it got there to begin with. If there is no print in the environment, add some! The trick is to have a few things handy just in case –something to write on and something to write with. It can be paper and pencil type stuff such as a notepad or even a phone. As long as you can write using it. Make a sign! What would be a good sign or message to have in the area? Where would you post it? Write captions! Look at something or take a picture of something and write a caption for it. The caption could be a description of the scene. Write a news story! Just the facts. Who is doing what? When and where? How and why are they doing it? Play a word game! Everyone makes a list of five things they can see. Take turns guessing things until everything has been named. 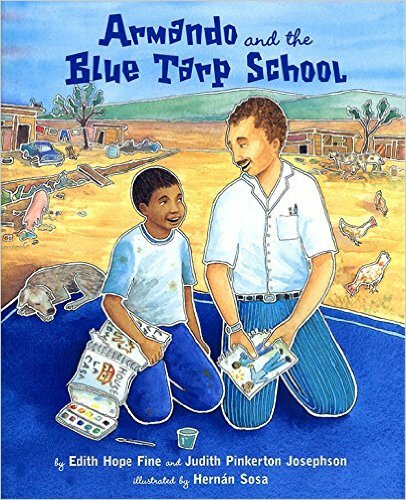 Or lay a blue tarp on the ground and start a school!